The CoBloWriMo prompt for today is “Ensemble”. It made me realize that I have not yet shown you my new crossover Regency gown. The gown will be the base for future ensembles. I have plans to make a sleeveless bodice and an open robe to have different options for topping it off. Regency crossover gown, c. 1810-20 (Source: Vintagetextile.com). View of the apron front closure (Source: Vintagetextile.com). In fashion plates and paintings, there are a few more representations of crossover gowns. 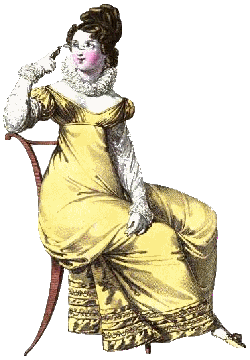 Date-wise, different crossover styles were especially “en vogue” in the late 1790s and then again in the mid-late 1810s. Below you can see two plates, one from each decade. The first is a crossover round gown and the second a French percale gown. Plate of a crossover round gown, c. 1798. Robe de Percale, Costume Parisien, c. 1816. Here is the finished crossover gown. 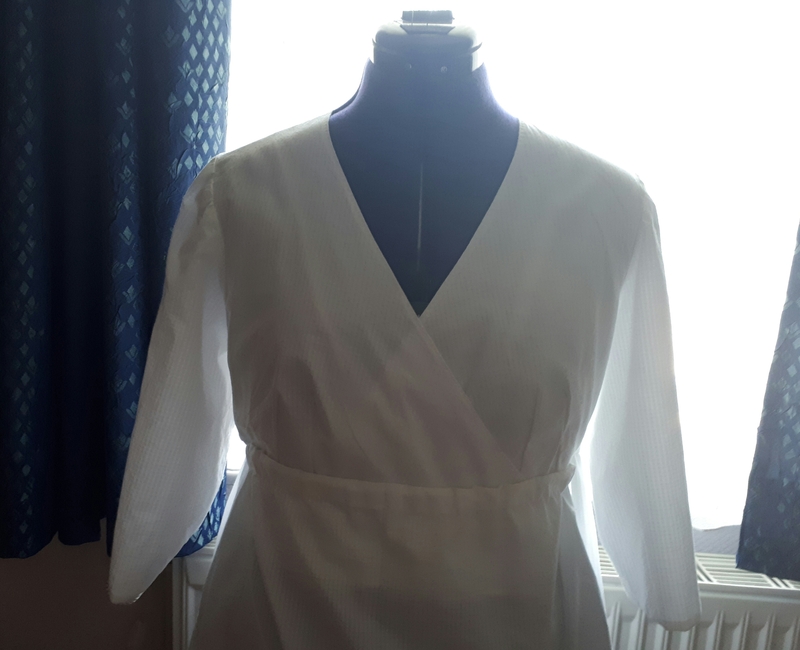 I made it using the Laughing Moon crossover gown, tunic and pelisse pattern. The fabric is a woven check cotton percale. After the photoshoot did not go ahead as planned, there are still no photos of me wearing it. So, for now, the dressform will have to do the job. The back view. I made the skirt without the optional train. The side view. The gown has a very “Regency-esque” silhouette, even without underpinnings. A closer look at the crossover front. You can see where the skirt ties over the bodice. Thank you! I know a lot of crossover gowns you see have ruffles or trim. But I am usually lazy about it and, with this one, I am not sure how the trim would get on with the patterned accessories I have planned.